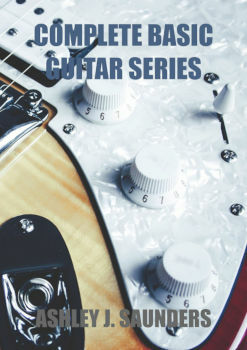 As a collection of all 10 basic series, The Complete Basic Guitar Series eBook will kick-start your guitar playing. This basic guitar method ebook covers a lot of ground while helping you build a solid foundation so that you can quickly progress. If you want to start learning the guitar in the correct way and build a solid foundation ready for quick growth. Then Complete Basic Guitar Series eBook will inspire you to play the guitar and is a great starting point in your journey. In the first section, you will learn many chords you can use to play your favourite songs today. 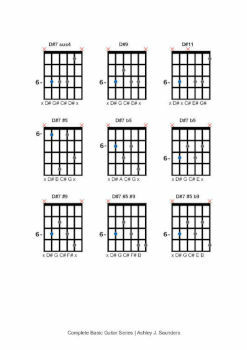 And although there 300 guitar chords are covered, all are working examples and can be used straight away. If you've heard of the CAGED system but don't have a clue, then section two will enable you to unpack the system and apply it to the guitar. CAGED underpins all that we do as guitarists and so it's critical to understand the system. 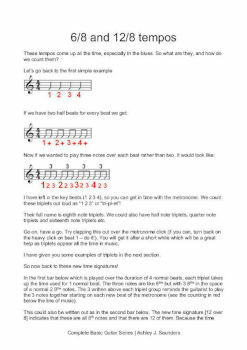 The third section, Inner Workings of Music is a practical music theory book. By reading this section, you will understand the framework which makes up music. Section four deals with Scales. If you want to solo like your favourite rock star, then you first need to learn scales. We'll cover some scales that you probably already know and some you won't. Sections five and six work together. 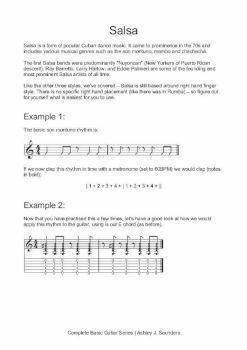 Rhythms in 4 is a superb reference of over 200 rhythm patterns and ideas. Whereas Improve Your Sense of Time and Rhythm will outline how best to use these rhythm patterns to strength your internal metronome and become a great rhythm guitarist! Introduction to Big Band Rhythm Guitar Style is section seven. If you want to start playing jazz guitar then this is a great starting place. We'll cover common chords and rhythms. Section eight, Introduction to Latin Guitar Styles kicks it up a notch and will give you some cool rhythm guitar ideas and will test your coordination! Testing your coordination in a different way, section nine is about Finger-style Guitar. This is a great module for all guitarist and will get you to think about how each hand interacts with each other. Get Started with the Blues is the final section and will enable you to discover the Blues as well as basic soloing. This is the only basic guitar method ebook you need. This eBook is aimed at those want to start learning the guitar in the correct way. If you build a solid foundation then you'll progress much faster!